Bonhams’ record £6.1-million sale at the Goodwood Festival of Speed on 22 June 2007 is the best ever in the event’s 15-year history. It is the fourth most valuable motoring auction ever held in the UK. The sale saw no fewer than 14 cars surpass £100,000, with top spot taken by the 1932 Alfa Romeo 8C-2300 Spider which realised a spectacular £1.4-million. In party atmosphere, six-hours of bidding saw 315 lots sold – many way above top estimate - for a grand total of £6,158,731.The auction’s sold-by-value result was no less than 96.2%. Bonhams is a founding co-sponsor of the Goodwood Festival of Speed, and in keeping with the event’s 2007 theme of innovation and record-breaking, the automobilia section also excelled with selected lots from the family collection of Land Speed Record hero Sir Henry Segrave achieving a fine £41,000. Sir Henry’s personal photograph and film collection was secured by the National Motor Museum Trust, Beaulieu, where it will join two of his most famous Land Speed Record cars, the 1,000hp Sunbeam and ‘Golden Arrow’. Keynote sales were achieved for the 50-year old Leyland transporter truck, built for the Formula One World Championship-winning Vanwall team – estimated to fetch £10–12,000, which sold for a tremendous £62,000. The UK Registration plate ‘FAT 1’ went for a whopping £56,500! DJ Chris Evans and actress Billie Piper both entrusted cars to the Bonhams sale and were rewarded with prices of £73,000 for his 1964 Daimler V8 Vicarage Convertible and £17,250 for her 1989 Porsche 911 Carrera Coupe. Top lots were: £1,409,500 – 1932 Alfa Romeo 8C-2300 Spider – magnificent 115mph Italian Two-Seater with supercharged 2.3-litre 8-cylinder engine. £452,500 – 1904 Panhard-Levassor 35hp Two-Seater – imposing 7.3-litre chain-driven model from motoring’s pioneer marque. £441,500 – 1926 Mercedes-Benz Model K Torpedo Transformable – exceedingly rare and highly important 6.24-litre supercharged classic. £381,000 – 1959 Lister-Jaguar ‘Costin’ Two-Seater – aerodynamic-bodied sports-racing car with multiple Championship titles to its name. £254,500 – 1954 Bentley R-Type Continental – magnificent streamlined sports saloon, ex-Lord Carnegie. £227,000 – 1964 AC Cobra Mark II – concours-winning Anglo-American classic in stunning condition. £221,500 – 1928 Bentley 6 ½-litre Tourer – open four-seater recalling the Le Mans 24-Hour race-winning legends. 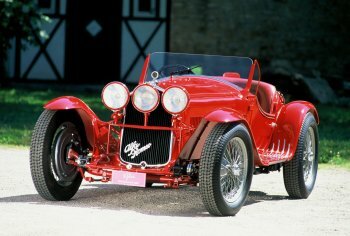 Bonhams’ record sale at the Goodwood Festival of Speed on 22 June 2007 was the best ever in the event’s 15-year history and was topped by the sale of a 1932 Alfa Romeo 8C 2300 Spider. Bonhams, founded in 1793, is one of the world's oldest and largest auctioneers of fine art and antiques. The present company was formed by the merger in November 2001 of Bonhams & Brooks and Phillips Son and Neale UK. In August 2002, the company acquired Butterfields, the principal firm of auctioneers on the West Coast of America and in August 2003, Goodmans, a leading Australian fine art and antiques auctioneer with salerooms in Sydney, joined the Bonhams Group of Companies. Today, Bonhams is one of the largest and fastest growing auction houses in the world. It offers more sales than any of its rivals, through two major salerooms in London: New Bond Street, and Knightsbridge, and a further seven throughout the UK. Sales are also held in San Francisco, Los Angeles, New York and Boston in the USA; and Switzerland, France, Monaco, Australia, Hong Kong and Dubai. Bonhams has a worldwide network of offices and regional representatives in 25 countries offering sales advice and valuation services in 50 specialist areas.